Materials: Small amount Worsted Weight Brown, Red, White and Black. Stuffing. 7 mm wiggle eyes. 16 mm Jingle Bell. Thread needle. Size G hook. Small piece of magnet. Rnd 2: Ch 1, sc in same st as joining, hdc in next 4 sc, sc in last sc, join as before. Rnd 6: Ch 1, sc in next 9 sts, in next st work (sl st, sc, hdc, 2 dc, hdc, sc, sl st) ear made, sc in remaining 14 sts. [Only one ear needed, Hat covers the second] Fasten off. Weave in end. Row 1: With Front of Head facing you, join white in first sc after ear. Sc in next 7 sc. [8 sc] Ch 1, turn. Row 2: Working in Front lps only sc in each sc across. Fasten off white. Turn. Row 3: Working in unused lps of Row 1 of Hat, join Red in first sc, sc in each sc across. Ch 1, turn. Row 4: Sc in each sc across, ch 1, turn. Row 5: Sc in first sc, dec over next 2 sc, sc in next 2 sc, dec over next 2 sc, sc in last sc [6 sc]. Ch 1, turn. Row 7: Sc in first sc, [dec over next 2 sc] twice, sc in last sc. [4 sc]. Ch 1, turn. Row 9: Sc in first sc, dec over next 2 sc, sc in last sc. [3 sc]. Ch 1, turn. Row 10: Sc in first sc, dec over next 2 sc. [2 sc]. Ch 1, turn. Row 11: Dec over last 2 sc. [ 1 sc]. Ch 1, turn. Row 12: Sl st in sc. Fasten off leaving a long end. Rnd 3: Ch 1, 2 sc in same st as joining, sc in next st, ( 2 hdc in next st, hdc in next st) 5 times, 2 sc in next st, sc in next st. Join [18 sc] Fasten off leaving a long end for sewing. Step 1: With Black embroider make a nose by using a satin stitch around Rnd 1. 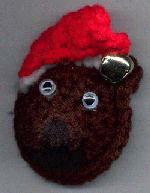 Step 2: With Black embroider a [ W ] smile for mouth under nose. Step 3: Position Back over the front and sew together, stuffing nose lightly so that it stands out. Step 4: Glue eyes in position about 1" apart. Step 5: Using Red strand, attach Jingle bell to end of hat. Weave in end. Step 6: Glue Magnet or Pin on Back.